Nick Linne connects on a pitch. The senior third baseman committed two errors in the field but also picked up two hits at the plate. 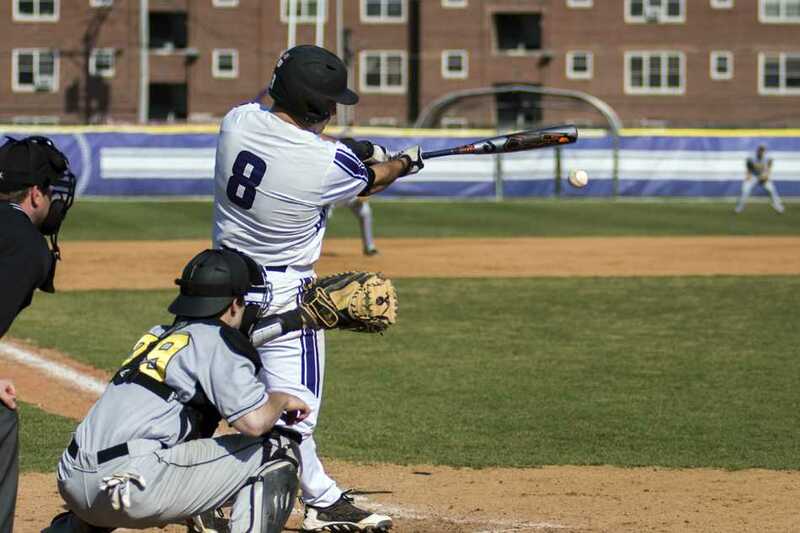 There was nothing particularly special about Northwestern’s 7-5 win Tuesday over visiting Wheaton College. The Wildcats (11-25) didn’t hit any home runs or make any diving catches. They didn’t shut out their opponents or score an abundance of runs. Throughout the game, NU rebuffed every Wheaton advance. Each time the Thunder (18-13) scored in the top of an inning, the Cats responded with runs in the bottom half. Junior shortstop Cody Stevens led the way with four hits — raising his batting average above .300 to .302 — and 2 RBIs. Senior Nick Friar started the game on the mound and threw six up-and-down innings, allowing 4 runs (though only 1 earned) on six hits. In the seventh, Friar was replaced by freshman Joe Hoscheit, making his first collegiate appearance on the mound. Hoscheit became the Cats’ 14th pitcher this season, as Paul Stevens continues to search for reliable arms. Hoscheit ceded only an unearned run in his two innings of work, and senior Jack Quigley closed out the win in the ninth. Senior third baseman Nick Linne, who recently changed some aspects of his batting stance, went 2-for-4, the only Cats player besides Cody Stevens with a multi-hit game. NU’s defense wasn’t particularly strong, as the Cats made five errors leading to 4 unearned runs. Linne, who committed two of those errors, refused to blame the miscues on the sometimes erratic field conditions at Rocky Miller Park. The win was the Cats’ seventh in 10 games and fourth straight out-of-conference victory. NU is back in action Wednesday at home against Chicago State, whom the Cats beat twice just last week.